Wurzburg, a beautiful and historic city in the Franconia region of Bavaria, remains something of a hidden gem among tourists visiting this part of southern Germany. Read on for our guide to breaks in this part of the world. Despite its scenic location, impressive architecture and reputation for fine wines, this settlement on the banks of the River Main is often overlooked by travellers drawn to larger destinations like Munich and Nuremberg. However, going on holiday to Bavaria and not spending at least a day or two in Wurzberg should be cause for regret if you have even a passing interest in Bavarian history and culture. By hiring a car in Munich and heading north, you could be enjoying a glass of Franconian white wine at one of Wurzburg’s many charming terrace restaurants within two and a half hours. Wurzburg is informally known as ‘the city of 100 churches’ and exploring some of its famous religious sites is a great way to spend a few hours, whether you’re there for a day trip or enjoying a longer stay. Many of the city’s churches have survived intact for hundreds of years, with architectural styles ranging from the Gothic to the Baroque. Popular sights include the Cathedral of Saint Kilian, which is Germany’s fourth largest Romanesque church building. A museum has been located at the cathedral since 2003, housing about 700 works of art from the last 1,000 years. Visitors will find pieces by the likes of Johann Zick, Anton Urlaub and Joseph Beuys here. The Kappele church, a small Baroque chapel dating back to the 1740s, is also well worth a visit. This pilgrimage site, which is reached by walking up a steep lane, offers picturesque views over the River Main and the rest of Wurzburg. To witness an example of architectural splendour on a much bigger scale, head to the Wurzburg Residence. Built between 1720 and 1744, this stunning palace is a UNESCO World Heritage Site and one of the finest Baroque structures in Europe. The interior of the building is renowned for its spectacular staircase, which features large frescoes painted by Venetian artist Giovanni Battista Tiepolo. Daily guided tours of the palace are available in English. Incredibly, the Wurzburg Residence is not unrivalled as the city’s major landmark. 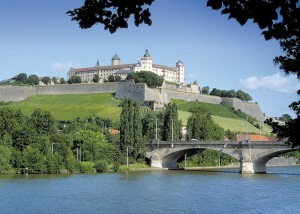 The Marienberg Fortress, which towers imposingly above Wurzburg and the surrounding area, was the home of the city’s powerful prince-bishops for several centuries. Many of Wurzburg’s historic buildings were carefully restored after the second world war. Much of the city was reduced to rubble in a 1945 bombing raid, with about 80 per cent of the buildings sustaining severe damage. For many Germans, Wurzburg is synonymous with outstanding wines. The city hosts a number of wine festivals throughout the year and cellar tours are available if you want a look behind the scenes at one its many wineries. Keep an eye out for the distinctively shaped container – known as a Bocksbeutel – that the region’s wines are commonly sold in. Popular restaurants in the city include Alte Mainmuhle, which offers al fresco dining in a rustic setting with great views of the Marienberg Fortress. Another highly rated option is Juliusspital, a traditional wine bar serving a range of Franconian delicacies.